Minnesota Women in the Labor Force – Part 2: What Do They Do? A previous post highlighted the important role that women play in Minnesota’s labor market—from their record participation in the labor force to how the recession impacted women’s employment. 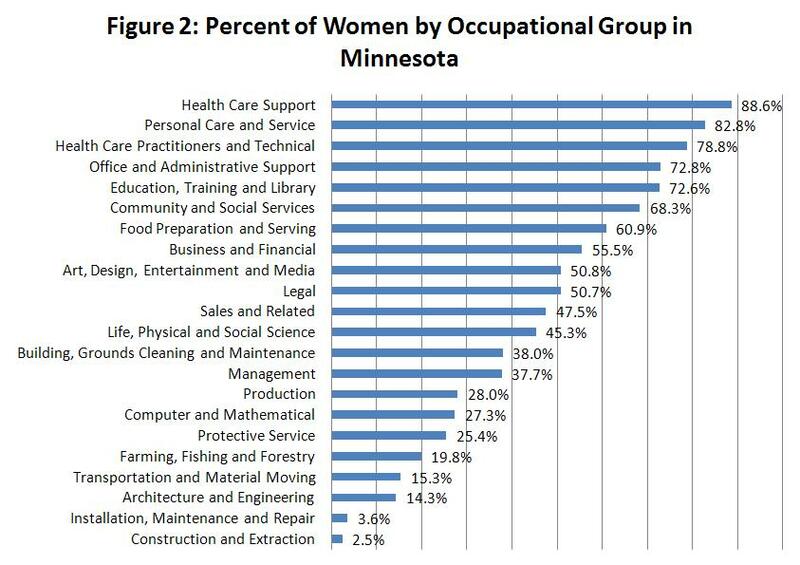 One key piece in this discussion is the differences between the industries and occupations in which Minnesota women and men work. 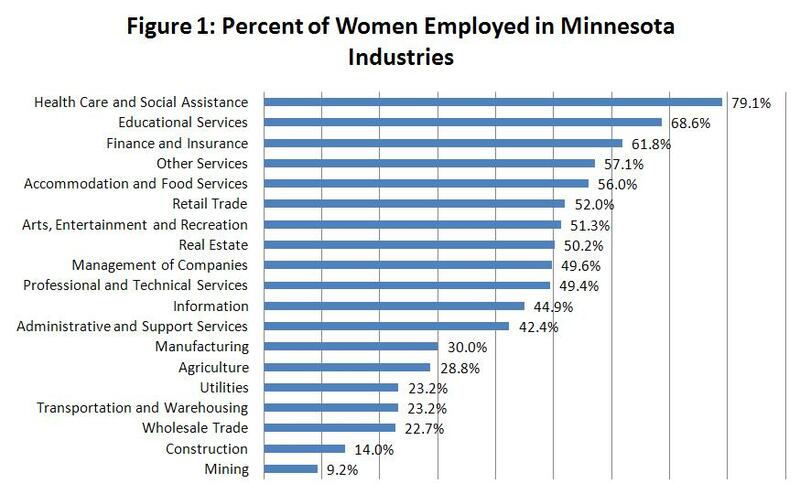 Alternatively, Minnesota women make up just 9.2 percent of employment in the mining industry and 14 percent in construction. Source: U.S. Census Bureau, Quarterly Workforce Indicators, second quarter, 2010. The difference between the industrial concentration of men’s and women’s employment is one reason that Minnesota women fared somewhat better than men during the recent recession. Health care and educational services continued to grow between 2007 and 2009, and these industries had higher concentrations of women jobholders. Source: U.S. Census Bureau, American Community Survey, 2009. Occupational selection is one reason why pay between men and women differs. Some of the occupations that women traditionally work in – like health care support, personal care, and some office support positions – pay less, on average, than male-dominated occupations in the manufacturing and construction fields. Nontraditional careers for women include fields where women make up less than 25 percent of employment. For women, nontraditional jobs often include those in construction, maintenance, engineering, and transportation. This is not to suggest that the skill sets of nontraditional careers should discourage someone from exploring these options. The skill sets of a male-dominated occupation (like construction manager) may actually be very close to the skills needed for meeting and convention planners, a field dominated by women. Green careers are another occupational field traditionally dominated by men. Green careers have a direct or essential impact on a product, service, or process that results in environmental benefits. Many green jobs exist in the engineering, construction trades, and production fields – positions usually held by men – and typically pay above average wages. Women can succeed in green careers too. Learn how some Minnesota women who doing just that. Wage considerations are not the only reason women might want consider a non-traditional career field. Some women may find that their skills, knowledge, and (in the case of green careers) passion for the environment lend themselves to a non-traditional career path. Ultimately, the job you choose should reflect what you like, what you’re good at, and whether the job is making the best use of your talents. If you’re unsure about which career is the best fit, you might want to take a career assessment to see where your talents lie. If you’d like to see how your current skills transfer between jobs, consider using the mySkills myFuture tool. Stay tuned for Minnesota Women in the Labor Force – Part 3: How Much Do They Make?, which will look at pay and income differences between men and women. Or read the first post in this series, Minnesota Women in the Labor Force – Part 1: An Introduction. Rachel Vilsack (rachel.vilsack@state.mn.us) is the Coordinator of Special Projects for Minnesota’s Labor Market Information Office at the Minnesota Department of Employment and Economic Development.